This recipe has been a favorite in my house for a few years now and it is completely insane to me that I haven't shared it on the blog yet! It's the perfect way to pack in lots of veggies with a ton of flavor and (aside from a little prep work) it is so easy, it comes together for a delicious weeknight meal in under an hour. I found the original version of this recipe (written by Ellie Krieger) a few years ago in Fine Cooking Magazine and it really became my first foray into developing Indian/curry flavors at home. You can really customize this recipe with your favorite seasonal veggies, just be aware of cooking time differences and you'll be fine. Some of my more successful swaps have been butternut squash for the sweet potatoes and frozen broccoli for the frozen cauliflower. I like to serve this over rice, but couscous also works well, I've even served it up with a simple naan bread for dipping a time or two. I really can't endorse this recipe any better than to say that my picky toddler ate a whole serving of it for dinner last night. She likes curry, especially my Curried Chicken Pot Pie, but I had never tried a straight veggie curry dish on her before. The kid turns up her nose at hot dogs, chicken strips and raw veggies but chows down on a dish like this. I officially give up on trying to figure her out! 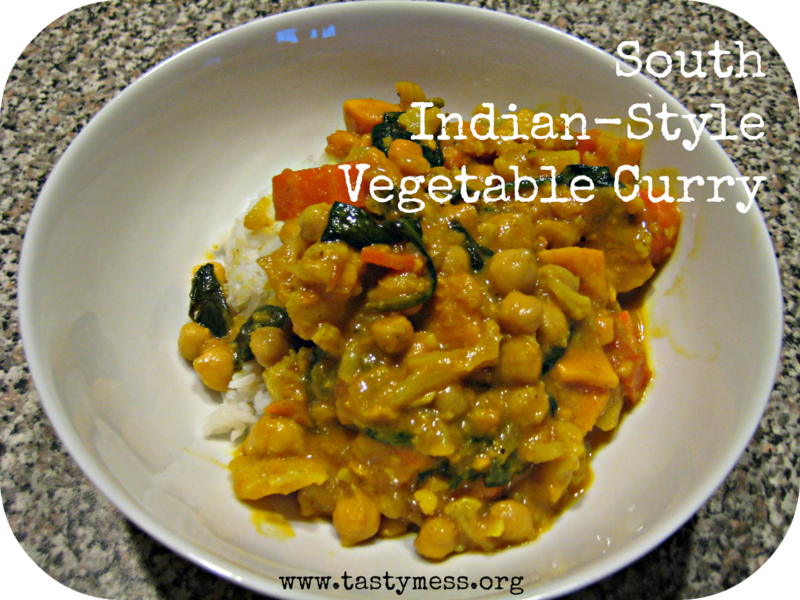 Since I was feeding this to my toddler I didn't add much heat to it, but this dish works really well with a dash or two of cayenne thrown in the mix, so don't be afraid to add the spice. Heat the oil over medium-high heat in a large dutch-oven style pot. Add in the onion and cook, stirring occasionally, until they start to brown. Reduce the heat to medium and continue to cook until the onion is completely softened and browned. Sprinkle generously with salt and pepper. Add in the garlic and ginger, cook for another minute, then add in the coriander, cumin, turmeric, garam masala, cinnamon and cayenne pepper. Stir to combine the flavors and cook for about 30 seconds. Stir in the tomato paste until well blended, about 1 minute. Add the broth and coconut milk, bringing the mixture to a boil. Reduce the heat to simmer and cook for 10 minutes. Add in the cauliflower, sweet potatoes, tomatoes and carrots. Return the mixture to a boil, then reduce to a simmer. Cover the pot and let it simmer until the veggies are tender (about 20 minutes). Stir in the chickpeas, spinach, lime juice and zest. Cook for another 3-5 minutes until the spinach is wilted. Serve over rice, couscous or naan.